Wednesday, April 18, 1888 Cool & windy, but pleasant till about sunset when had sprinkle or two. 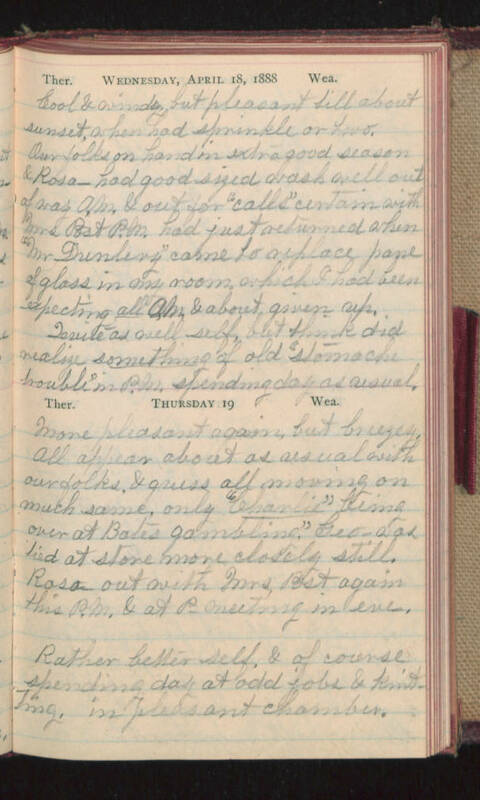 Our folks on hand in extra good season & Rosa- had good sized wash well out of way A.M. & out for "calls" certain with Mrs Post P.M. had just returned when "Mr Dunberg" came to replace pane of glass in my room which I had been expecting all A.M. & about given up. Quite as well self, but think did realize something of old "stomache trouble" in P.M. spending day as usual. Thursday 19 More pleasant again, but breezey. All appear about as usual with our folks, & guess all moving on much same, only "Charlie" being over at Bates gambling". Geo- was tied at store more closely still. Rosa- out with Mrs Post again this P.M. & at P- meeting in eve. Rather better self, & of course spending day at odd jobs & knitting, in pleasant chamber.